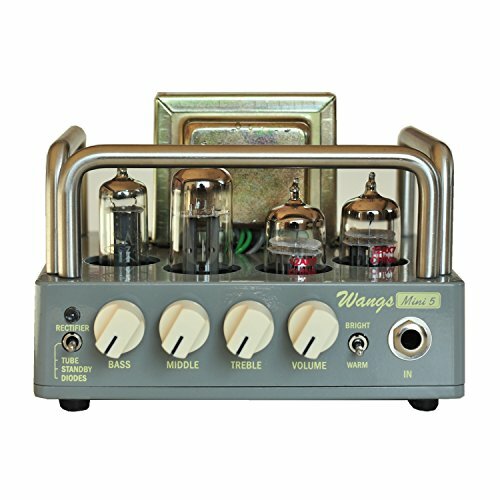 The Mini 5 is Wangs' 5-watt all tube head. It runs on a 12BH7, a pair of 12AX7 tubes and a 6Z4 rectifier. Across the front are Bass, Middle, Treble and Volume knobs. There's also a pair of toggle switches. The first offers a Standby as well as Diodes and Rectifier modes. The second switches between Bright or Warm. Around back is a power switch, an IEC socket to plug in the supplied power cable and a pair of ¼" speaker jacks. The Mini 5 can run at 8 or 16 ohms. The footprint of a the amp is a compact 5 ¾" x 4 ¾" x 4". The electronics are mounted in a solid metal chassis. Plugging in, my first impression was how clean and dynamic the amp was. Every little pick scrape is audible whether you like it or not! The Mini 5 also works extremely well with pedals in front of it.